Where the Sidewalk Starts: Parklets: Neighborhood Amenity or Waste of Parking Spaces? Parklets: Neighborhood Amenity or Waste of Parking Spaces? 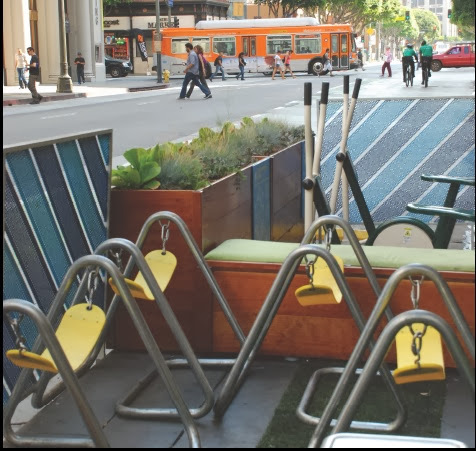 LA's Spring Street parklets feature a variety of seating options, like these swing seats, as well as exercise bikes, tables, landscaping, and even a foosball table. As more and more cities begin to question the value of flooding their urban areas with surface parking, new ideas for street space have begun to catch on. Parklets, made popular through events like Parking Day, transform on-street parking spaces into small public parks and represent a relatively cheap and easy way to increase park space in otherwise built-out neighborhoods. San Francisco and New York have conducted limited evaluations of their parklets, and have found that they seem to increase pedestrian volumes while have a neutral to positive impact on local businesses. An Assessment of the Spring Street Parklets, a collaborative effort of the UCLA Complete Streets Initiative and Parklet Studies, includes a more detailed evaluation of two of Downtown Los Angeles' four new parklets. 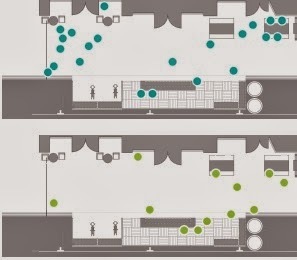 Using a combination of bicycle and pedestrian counts, activity mapping, and interviews with users and businesses owners, the report compares conditions in parklet neighborhoods before and after installation. Volunteers mapped the location of parklet users at different times of day as part of the evaluation process. The assessment results show increases in both bicycling and walking in the vicinity of the parklets after installation, though for both modes men are over-represented. In part this could be due to the continued perception of safety concerns for female walkers and bikers. At the same time, there was no noticeable change in parking occupancy in the parklet areas, suggesting that at least one common concern (the possibility of a parking shortage created by the removal of spaces for parklets) may not be as likely as many believe. Similarly, concerns about pet waste and panhandling in parklets were not supported by on-the-ground observations at the sites; instead, smoking was by far the most common "nuisance behavior" in the parklets. Parklets on Spring Street were mostly used on weekends, particularly during the mid-morning and mid-afternoon, with eating/drinking, using electronic devices, and play (sometimes all at the same time) being the most common ways people used the parklets. Users typically stayed between 10 and 30 minutes, which is consistent with parklets in other cities. Observers noted that parklets were used for both sitting and standing, which, in the authors' words, "... underscores the versatility of the parklet designs, which permit comfortable opportunities for both sitting and standing; short pauses and longer respites." 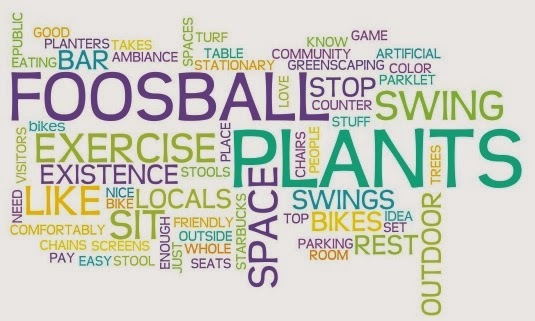 This word cloud shows users' favorite parklet features. Interviews with local business owners showed mixed support for the parkets: "While in general, we found that some businesses did not currently perceive a direct positive effect on their foot traffic or sales, they seemed to be more optimistic as to the parklets’ effect on their business in upcoming years." Still, many business owners would be reluctant to have a parklet in front of their own business, as they worried about the potential loss of parking (despite the fact that they also believed the majority of their clients arrived on foot). Tailor parklet design to the needs and tastes of their surrounding neighborhood. While additional evaluation of parklets is clearly necessary as they continue to become more common across the country, it appears clear that under the correct circumstances parklets can be an important community amenity--well worth the loss of a couple parking spaces.